About… yeah about time I filled this page out! Heck it’s December 2014! First of all, a big HOWDY from Robert Keeley. It has been a joy to work with so many amazing people over the years, finding tone and searching for that final touch that defines your tone. I’m even more proud to say that it has worked! People have finally found the tone that’s been in their heads for years! They have found the perfect compressor, found the perfect booster, the perfect delay or mod to their unit; and yes, they have found the Perfect Distortion! Read below for a little history about myself. So come on in and enjoy our laid-back Web site where you still have all of the features and comforts of a bigger business. We have email and phone support, we work hard to make sure backorders are constantly being addressed and solutions found, we honor our warranties, we care about your tone AND you. Please take an evening to read the reviews on the web at www.harmony-central.com under Keeley, and you’ll see why Keeley Electronics, Inc. isn’t just a manufacturer of high-end musical electronics, but a lover of tone and customers. LAST BUT NOT LEAST! THANKS SO MUCH FOR MAKING US A HUGE SUCCESS. LET US SURPRISE YOU WITH OUR LOVE OF TONE AND QUALITY SERVICE! I grew up in a music and engineering family. Both my dad and his dad were electrical engineers. My mom was the nicest, kindest person you could hope to meet. Taught me how to treat people. Dad played guitar in bands during college days and was a super star in the U.S. Air Force. I eventually got his 70’s Peavey Deuce amplifier. (JFET input stage, quad 6L6GC outputs, first thing I ever modified, and a negative feedback control to it in 1996 I think.) I started playing guitar in 1978 with a student model Yamaha acoustic guitar my grandma got me. I really dug in when I got to Germany. From 1984 to 1988 I played at least 8 hours a day I swear! Heck, there was Van Halen, SRV, Yngwie Malmsteen, you name it. There was Guitar for the Practicing Musican, there was Guitar Player magazine with Craig Anderton! I started in electronics in 1989 and have never wondered about doing anything else. I encourage anyone and everyone to become an engineer. I think it’s the greatest job you could ever have. Taught Analog and Digital Electronics, Math, & Microsoft Office. 😉 Worked there for one year, first half with very rewarding. Second half, could wait to quit and build pedals full time! First employees for Keeley Electronics were all students of mine. Very exciting. Students would bring Keeley Compressors in for me to finish up and ship off. Junior Engineer. One of the hardest jobs I had. Worked for an EE that designed the Glamour Shots system. Built circuit boards for video systems. Modified Thermal Printers and Video Disc Recorders. (Yup, that’s where the mods started!) Designed medical experiment equipment for tracking mice. Repaired Sony and Panasonic industrial and broadcast equipment. Super difficult. Since these pieces of equipment went into TV studios and hospitals, etc. they had to be Right. Most influential job I had in terms of the future of Keeley Electronics. Finished up my AS in Engineering here! First electronics job. Repair technician. Right out of a tech school for electronics and computers. (Our final project was building an Intel 8088 with 8087 math co-processor.) I started repairing car stereos, VCR’s, and moved to CD players and Big Screens. I learned the most from the endless Yamaha home amplifiers, and Kenwood and JVC car stereos I had to fix. Build speaker boxes for cars! I was thrilled. Made nearly $29,000 my first year at 19 years old. Barry Burns taught me more than you could imagine. Thanks Barry for giving me a no-nonsense approach to looking at electronics and the repair of circuits. He was a brilliant old TV guy. Thanks again! I have a couple of questions. Having just purchased a Taylor T5z, it occurred to me that a compressor might sound good with it. Not so much for an effect, but as part of the basic sound. I’m thinking of Monty Montgomery’s incredible tone here. What’s the difference in the GC-2 and the 4 Knob Compressor? Do you offer “industry accommodation” pricing? Of course I’ll reciprocate and offer wholesale pricing on our looper or other pedals. I’d love to own a Boomerang! Let’s talk. Call the shop sometime. 405-341-2025 and I’d be honored to work with you guys. I am enjoying several boss mods you all did for me. Thanks for sharing your gifts and wizardry. Can I send you my Big Muff Pi NYC pedal for you to modify. I did not see it listed on your web site. This is an one hell of inspiring story. Your pedals are going to be the foundation of my first album one day…one day . Make sure you get me a copy! We’d love to hear it! What a boost pedal can be used for a bass guitar? Power source would ( YOU) recommend.I would like to keep the most excellent pedals that I purchased from you on a separate power source than my other pedals. Thanks DW. I recommend the Voodoo Labs Pedal Power II. It is simply the best out there. I don’t recommend OneFitsAllSpot daisy-chain type power supplies. The noise level is high and you can run into problems when you configure and try to power high current devices. Trust me, get a Voodoo Labs power supply and never worry about it again. I am just doing research at this point but looking to open my own store front guitar store. What are your requirements for carrying your product? Is there an initial order by dollar amount or by pieces? Again, I am in the early stages but I own a few of your products and know them to be 1) quality and 2) tone conscious. I wasn’t familiar with Keeley pedals until Premier Guitar sent me an email saying they were giving away a pedal board loaded with them! Imagine my surprise as I was reading up on them to learn that they’re made just down the road from me in Tulsa! I’ll definitely be looking more into them – until I win the whole bundle, of course! Thanks folks for the kind words! Picked up a Keely Compressor pro yesterday. Very nice touch I must say! At any rate, the blue led is SO BRIGHT, you can’t read anything else on the legend plate when it’s on! THAT is a real problem, in my estimation! Typeface of printing is also way too small. Hard to read any of it when your eyes are 5 feet above the box when using it. You’re just literally blinded by the piercing blue illumination. I’d suggest dropping the led voltage to about half of current level. It is really offensive visually. I put a piece of tape over mine and it’s still too bright! As far as audio processing is concerned, it’s pretty quiet, and has fully functional controls. I also have an Effectrode PC-2A compressor (tube output). That is my top compression pedal, but it doesn’t do some of the things the Keely can! and find it also a very clean sounding output. Overall, it is a great product IMO. I’ve been using comps for 40 years, and have had some very nice studio units, but this box seems very apt to compare against all comers. Thanks for making a great box! I’ll be using it consistently. Thank you so very much! Yes, I hate my blue LEDs too. I’m doing something about it post haste. Your words are very kind. I very grateful for you writing. I can modify your unit if you’d be so kind as to send it to me. I live in Australia and I am interested in purchasing an banes tube screamer and having you modify it. Can you purchase one on my behalf modify it and ship it to Perth in Australia? We stopped modifying pedals in October. I’d recommend our Oxblood for the ultimate overdrive and distortion! The DynaTrem is digital sir. Thanks for asking! in a Klon overdrive. That said is any of the Keeley ovedrives based on the Klon? Thanks for the great question! Our Oxblood destroys the Klon. Please check out the videos! We have them in stock and by far it is our most popular overdrive/distortion. I am working on that sir! New Red Dirt Germaniums are being built next week and going out to a host of demo guys! Hi Robert. I missed the Nocturner sale. Are you planning on including this in your product line? Chicago Music Exchange has a few left last time I checked. Call them up and see. If they don’t I will make one custom for you. I’m considering buying a TS-808 and have you Mod it. Do you make a pedal that in your opinion can replace the Classic 808 or close to it in tone and performance? Or would it be better to do the mod? 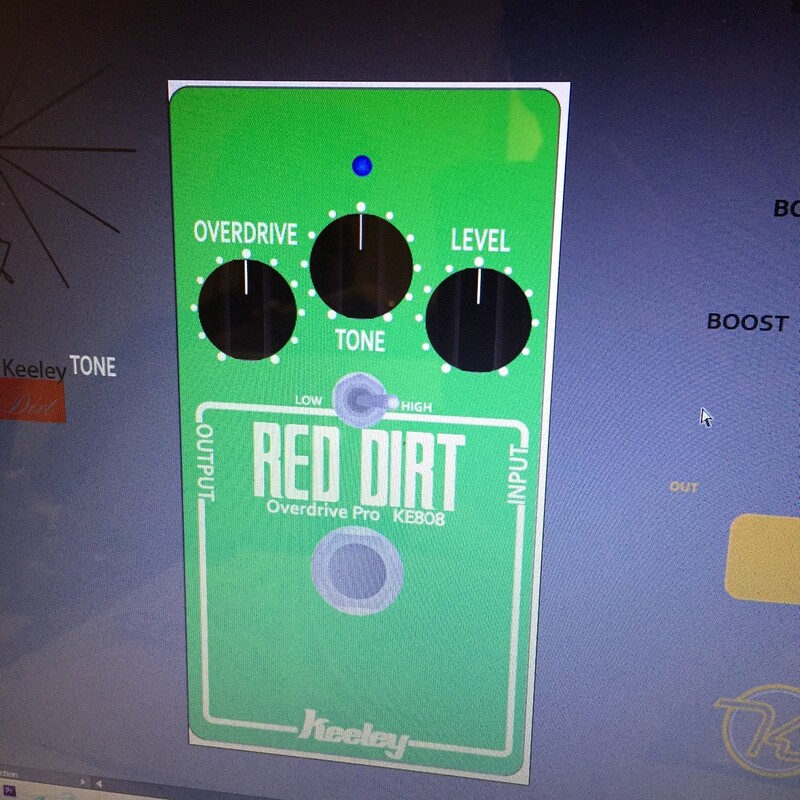 When will you be making more Red Dirt Professional Overdrive pedals. The 1st batch sold out so quick! ps, we can make one for you if you like, just call and ask for Lisa. Sometimes dealers by Blemished units and I can’t always control where they might show up. Nope, you are right, that doesn’t look good at all. We spend a lot of time and effort into making things look good. Give Lisa a shout at the shop, I bet you she’d make you a SMOKING hot deal on a comp if you tell I said so. Yes sir, we do ship to Brazil! What stockists sell this product down under please? I purchased several of your pedals back in ’04. (2-knob Comp, Katana Boost, TS9/+808, Boss Bd-2, and Boss DS-1. And most recently Cavern:Reverb/Delay. I have been totally pleased with all of them and they serve me well, night-in and night-out. But, as of recently i’ve noticed the Java Boost, which I’ve always ran as a “lead-boost” (push/pull “IN”)at the end of the drive pedal(s) chain, adds a tremendous amount of bass/low-end. I’ve tried it with push-pull “out”, but low-end is even louder. Example of pedal chain: guitar out to > comp>BD-2>TS9>DS-1>amplifier input. I’m using a DR.Z Maz-18 NR 1×12, running the master volume around 11 O’clock and pre-vol around 2 O’clock, its just at the point of breaking up but still clean if I play lighter or strum. It adds too much low end even clean with no other pedals engaged. Is there possibly something that could need replaced in the pedal that would cause this? I’m not getting any noise or any other issues, otherwise. Is there any chance you can send that back to me, my attention, RK must listen to and inspect. The Java Boost as you know should actually CUT bass. It’s a treble booster. I suspect something is very wrong. Thanks for your business sir! What is your return policy for pedals bought here on the website? We allow 48 hours to test the pedal and let us know if you want to send it back. I’m not too picky on that. What matters is your satisfaction. Most people can tell if a unit will work in their rig within 48 hours. I’ve owned and enjoyed the 2 and 4 knob comps, Fuzz Head, TS9DX Turbo, and dual Phaser. Your new pedal designs look great! When will the Deluxe Vibe-O_Verb be available? Robert, out of curiosity, was your dad stationed at Scott AFB in the early 80’s? I just purchased a Keeley Double Tracker from Pro Guitars and I was wondering if you had any recommendations about the placement of the pedal on my pedal board. Should I treat it as a modulation type pedal and place it last in the signal chain? You can think of it as a modulation pedal or a “end of chain, amplifier splitter” It depends on how you want to use it really. If you have two amps, then I’d use it as the last in line certainly. If it’s going to be used for a chorus type sound, then after your distortions would be great. Let me know if that helps! I’m a bass player and been looking for an awesome chorus pedal and your new Seafoam just seems prefect!! Also can you tell me when your new delay mutlti m8 will be available in the UK or is it better to by direct from your good self! Does the mutli 8 have the 30 double tracker and aurora reverb in there or is it a new discrete effect?